Guinea pigs are intelligent and inquisitive little creatures that can make fantastic pets and provide their owners with endless entertainment. New owners are excited to discover that they actually enjoy playing with objects and interacting with humans! Below is a list of the 10 best guinea pig toys you could buy your little furry friend! In our review, we look at their main features, pros, and cons. The products below were chosen based on user ratings and reviews, utility, resistance, and fun levels. 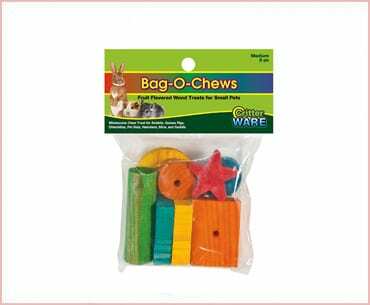 This is a bag of small pet treats that will keep your guinea pig entertained and busy. 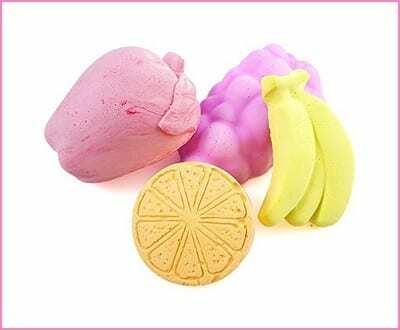 The 8 chew toys included in this set have a fruit flavor that is enticing for your little pet, and they’re made of pine. They come pre-drilled, so you can safely secure them on a treat-k-bob dispenser. Come in a delicious fruit flavor. Need to be checked for splinters before you offer them to your pet. If your pet is a heavy chewer, you will need to replace these often. Not extremely entertaining, since they are made mostly for chewing purposes. These grinding stones are listed as one of the best guinea pig toys for a few reasons. First, they’re great for the oral health of your little buddy. Plus, they’re safe, colorful, long-lasting, and very cute! They are made of lava rock, which is great for keeping your pet’s teeth clean, trim, and healthy. They can also help with mental stimulation. Comes in adorable fruit shapes and colors. Watching your guinea pig gnaw on a tiny banana is almost too cute to handle. Made of lava stone calcium, and safe for chewing. Some guinea pigs are not interested in this type of toy. Only last until your guinea pig chews it up. They are larger than pictured. These little vine balls are some of the best guinea pig toys because they are both fun, safe, and all-natural. 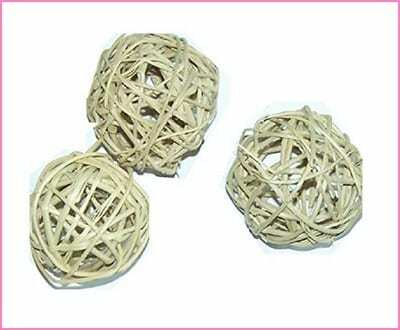 They are made of willow wicker vine, which is a lightweight material that can be shredded and carried around. 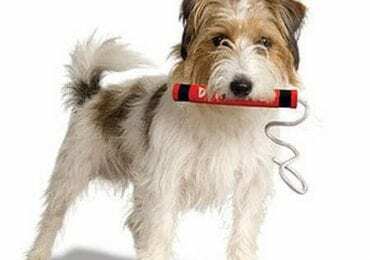 They can provide hour-long entertainment for your pet, and they can also help relieve anxiety and stress. Can make a mess when shredded. Only lasts as long as your guinea pig lets it. The balls are quite small. This is one of the best guinea pig toys because guinea pigs love little hiding places. 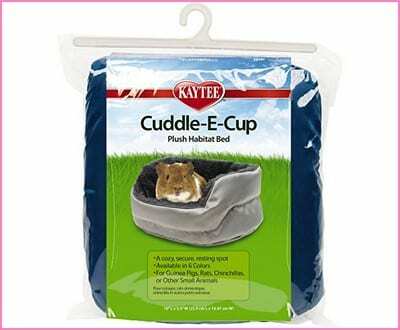 You can put this little hideout anywhere in your guinea pig’s pen or cage, and trust that they will be safe and sound. 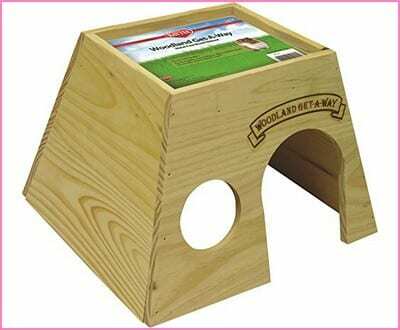 It is constructed of safe and chewable wood, and it provides a great place for your guinea pig to nest, sleep, hide, or just relax. Safe for your guinea pig to chew and rest in. Durable and long-lasting all-wood construction. Provides a nice getaway for your guinea pig. Not large enough for more than one guinea pig at a time. Small guinea pigs might get stuck in the window. The house is smaller than pictured. 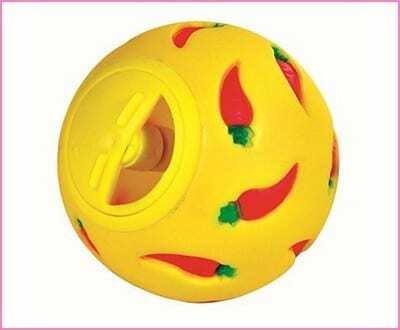 Provide your guinea pig with hours of entertainment with this neat little treat ball! It is a fun and interactive way to help your guinea pig get a great workout and interact with you. They can roll this ball around the house and alleviate their boredom. A great way to bond. Bright yellow with decorative carrots to appeal to your pet. The treats are a bit difficult to get out. The ball doesn’t hold a lot of treats at once. 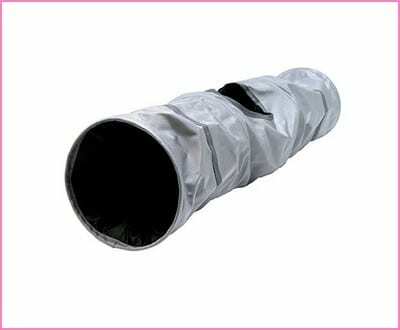 This fun tunnel is machine-washable and durable. It makes a fun toy or resting spot for guinea pigs. It can be placed in their playpen, or on the floor when you bring your guinea pig out for playtime! Guinea pigs love little hideaways and nooks, and this tunnel is a perfect way to meet this need, without letting them get stuck under the couch. Some pigs may want to stay hidden in the tunnel. 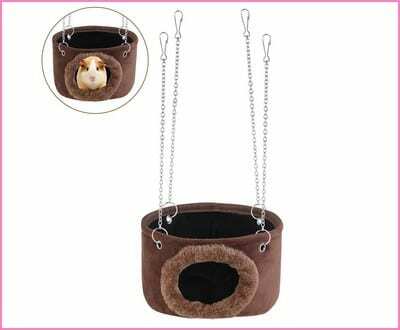 This ultra soft and cuddly pouch makes a great place for your guinea pig to snuggle and rest. 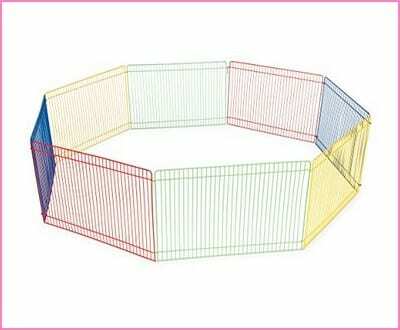 It is constructed with an ultra soft fleece interior, and it has high walls to help your guinea pig feel safe. The price is quite affordable as well. Some guinea pigs are uninterested in using beds of these kinds. Will become matted if put through a dryer. It is quite large, so it might not feel as cozy for smaller guinea pigs. 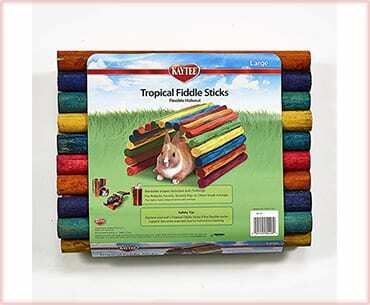 This adorable and colorful bendable hideout is one of the best guinea pig toys on the market. It encourages your guinea pig’s natural chewing and hiding instincts, and it’s really neat-looking. The toy is 10 inches long and 18 inches wide. Will likely be chewed up fast. May need replacing over time. Some people complained about their product arriving moldy. It is important that guinea pigs get lots of face-to-face time with their owners. A playpen like this is a must-have for exercise and mental stimulation. It is colorful, durable, and large enough for you to sit with your guinea pigs. It is made out of 9 panels, with a wire spacing of 3/8. The panels are 13 inches long and 9 inches high, creating a 36-inch diameter playpen. Not the largest available pen. 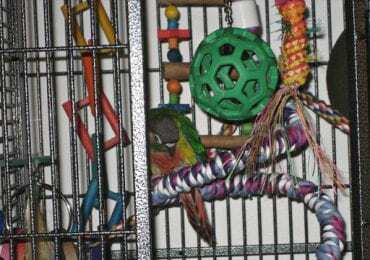 Owners should supervise their pets when playing in the pen. This snuggly hammock is the perfect guinea pig sleeping solution. 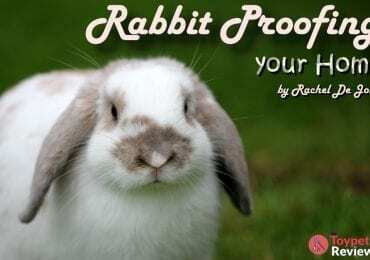 It is soft, durable, and makes your guinea pig feel safe and protected. Guinea pigs will love the swaying motion provided by this hammock as well! The texture of the hammock makes for an extremely comfortable sleeping place, while the quality of the materials ensure long-lasting use. Great for all types of guinea pigs. May not fit in all cages. Some guinea pigs might need time adjusting to it. The chains attached to the hammock are not extremely sturdy. The chains can get tangled. Guinea pigs love to play and interact with their owners. They should be given plenty of mental stimulation and ways to exercise and wear down their teeth. This will make them happier and healthier. We hope this list of some of the best toys for guinea pigs on the market has been helpful! Don’t forget to also suggest other best guinea pig toys down below! I’m so sorry, but I’m not so sure a lot of these things are safe for your piggie. Please do complete research before you hand these to your companions, some of these may have artificial dyes (treats) and the ball can cause back problems and rarely can even be fatal or have life long effects. Please be cautious for your fur (or no fur) baby! Hi Maggie – we updated the article and removed the products. We’re also looking into adding better products so to anyone reading this – we’re welcome to suggestions! Thanks! Check out our other comments on here for more details! Have a great day! Guinea Pigs should never be placed in an exercise wheel or ball – these items can seriously harm them. They can injure themselves or worse – die of heat stroke. Please do futher research on Cavies as several of your suggestions don’t work for this particular breed of rodents. Thank you for your input! We will definitely look into the matter further. 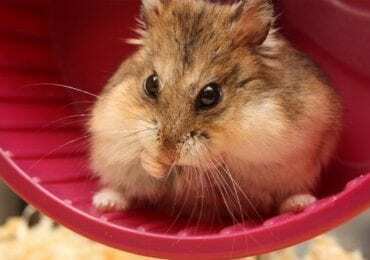 Lindsay is right, enclosed balls have lots of problems for guinea pigs. This really shouldn’t be on the list. We’ve removed the ball and wheel from the list, as well as the chew sticks. According to our research, chew sticks that contain grains are also extremely dangerous and can be harmful to guinea pigs. Thank you for your input and we’re sorry it took so long to rectify our mistake. Guinea pigs, defiantly need somewhere to hide the tropical fiddlesticks are really neat! This helped a lot. Hello Dan! Thanks for the input – glad we could be of service! 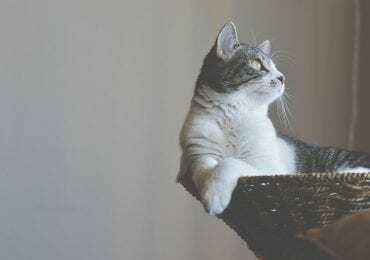 We’re looking into better products for our lists so if you got something you love for your little furball, let us know! Hi Cerys! We removed those and the chew sticks. See our comment above for more info!